The Department of Human Services Self Sufficiency office in St. Helens intends to offer its clients safety reflector key chains to make them more visible as pedestrians. The offer is being made possible following a donation from two community members Wednesday, March 9. Victoria Worral, a Columbia City resident, and Cameron Willett, branch manager of the St. Helens Wauna Federal Credit Union, presented a donation of $1,200 worth of safety reflectors to Stephanie Wetherbee, an employee with the state Department of Human Services, on Wednesday. Using donated funds from the credit union, Worral, who jokingly calls herself the “Reflector Lady,” was able to provide 480 safety reflectors to St. Helens Self Sufficiency to distribute to those who need them. 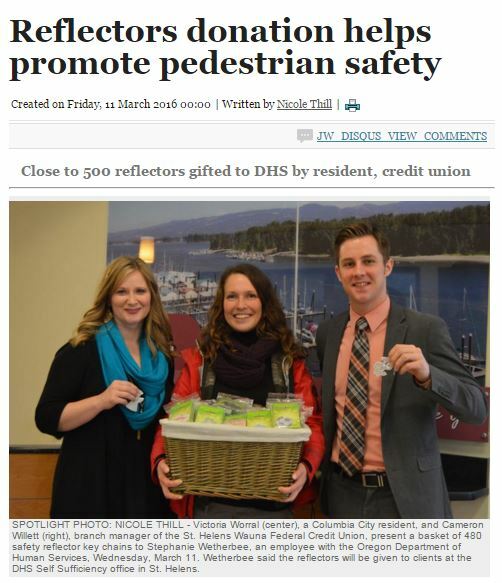 Worral has been promoting pedestrian visibility through the use of safety reflector keychains throughout the St. Helens area for nearly two years. The donation will help promote safety and visibility for Columbia County residents by removing any economic barriers that might be exist, Wetherbee explained. Worral met Willett at a Columbia County Rotary Club meeting in 2014 when she was promoting a safety awareness campaign through the use of reflector key chains. Willett said his two children regularly walk home from school, and Worral’s message stuck with with him. The two struck up a deal more than a year ago for the credit union to purchase reflectors that could be donated to the St. Helens community. Worral spent most of last year working with Glimmis, a Swedish company, as a reflector distributor. During that time, she began to work with elementary schools, local businesses and, eventually, the St. Helens Youth Council, making connections in the community to sell and donate reflectors. One of those connections was also with employees at the Self Sufficiency office in St. Helens. Wetherbee said the office plans to give reflectors to any client who comes in and may need one, including young families and adults who walk in areas that may not be well lit. “It’ll still go to the same population of folks, children and families, people that will be in need and will be grateful to get these reflectors because they are traveling on foot and on bicycles, really all times of day and even at night,” Wetherbee said. Wednesday’s donation also marked a small turning point for the work Worral has been doing. When Worral began her safety awareness campaign, she started by promoting reflectors for school-age children, enticing them with cool designs. Providing reflectors to an agency that serves a wide variety of clients of all ages will promote safety among adults as well, Worral said.